For as long as Mario Balotelli has been in the public consciousness, he’s liked to do things his own way. The Italian showed us his taste for the unexpected during his time at Manchester City, earning as much attention for what he did off the pitch (or what people claimed he did) as for what he did on it. Part of the reason so many may be drawn to him, though, is purely because he has never been one to rise to our expectations – even when our expectations involve him ignoring our expectations, he finds a way to take it to another level. In fact, it has often felt as though Balotelli’s career has acted as a test, seeing how far he can push the envelope without sending Proper Football Men into fits of rage so explosive it feels as times as though they’re moments from spontaneous combustion. During a pre-season game against LA Galaxy in the summer of 2011, for example, Balotelli strolled through on goal before sending a spinning backheel wide of Brian Perk’s left-hand post, with Roberto Mancini substituting him immediately as punishment. That might have been the extreme example of doing the opposite of what is expected – a striker, through on goal, is generally expected to test the goalkeeper. However, you don’t sign Balotelli in order to get a conventional striker, and this is one of the sacrifices you make if you also want to get the most out of the good surprises he provides. This has continued in France, where, away from the same limelight he received in Manchester, Balotelli has given the illusions of being a normal, productive striker while we weren’t looking. He scored more than 40 goals for Nice in his first two seasons with the club before jumping ship for nearby Marseille and scoring in five of his first seven games under Rudi Garcia. It feels as though he has reached the stage where goals are becoming a given, allowing him to make time to work on more important things – like celebrations. Against Saint-Étienne, Balotelli followed a tidy acrobatic finish from Florian Thauvin’s corner with a group selfie after collecting a phone from behind the goal. The readiness of him to grab a phone from the cameraman makes you think that not only did he have the whole thing pre-planned, but he only tried it for this game, safe in the knowledge that he would score a goal worthy of such a reaction. Sure, you might not be supposed to go into a game pre-planning a celebration with the assumption a goal will come, or at the very least you shouldn’t make it so obvious, but Balotelli has correctly identified that there’s hardly likely to be any backlash more dramatic than what he’s seen before. You know what else is frowned upon? Over-elaborate celebrations against your former club – especially when it’s less than three months since you left. 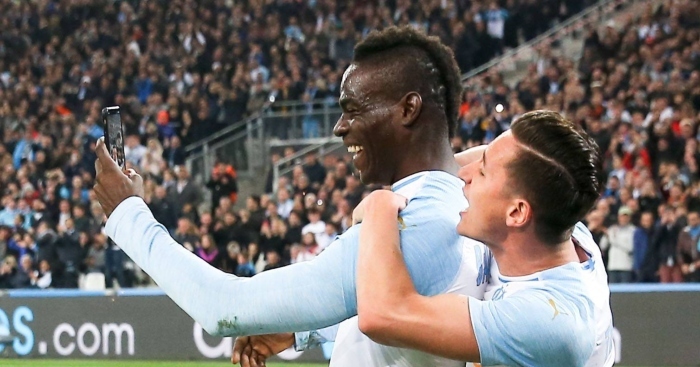 Did Balotelli stick to those rules after heading home what proved to be the only goal of the game in Marseille’s victory over Nice? You already know the answer. Other players might have gone through the motions with a muted celebration, but other players might not want everyone to know just how much they’re enjoying their football. The game has its peaks and its troughs, and if you can’t hide your dissatisfaction with the latter then why not let everyone know when things are going just the way you want. The quality of the goal doesn’t matter – what’s crucial is not that he’s doing what others can’t but rather that he’s doing exactly what he has planned. The game of rock-paper-scissors with Thauvin which follows is just an outward display of comfortability. Perhaps that has always been the problem with Balotelli from some quarters. His relaxed air is a deviation from the seriousness with which certain people think football should be played, and this is only exacerbated by Balotelli’s refusal to cede to this line of thinking. With so many people attempting to attribute a fuller understanding to football, the presence of someone who so flagrantly resists this is hard to square with what they’ve been led to believe about the game. It’s not going to get any easier for them, either: the circumstances around Mario Balotelli might end up changing, but his own behaviour will be modified by him and him alone.